Bethlehem Steel announced on Thursday the signing of free agent center back Hugh Roberts. Roberts, who last played for Richmond Kickers, was named to the USL All-League First Team in 2016 and was also a finalist for Defender of the Year. The 6-foot-4 defender had 30 starts in 2016 and is one of just two USL players to have played 2,700 minutes in the 2016 season, during which Richmond’s defense was the third best in the league, allowing only 28 goals while recording 13 shutouts. The 24-year-old native of Olney, MD signed with USL-side Richmond Kickers in March of 2014. In his three seasons with the Kickers, Roberts played over 6,000 minutes. Before that, he played college soccer at George Mason University between 2010-13. Roberts also played for PDL side Baltimore Bohemians, where he was named to the PDL’s All-Eastern Conference First Team in 2013. The primary question to ask is whether he has the speed to play a high line. He ticks all the other boxes. Richmond played a kaleidoscopic interchangeable whirl among its attacking six, certainly at times they were high pressing the ball, so Roberts has had some success with a tactic similar to the various Union teams. The signing further confirms that Mark McKenzie is being switched to a flank defender spot. Note that the signing is of a free agent. 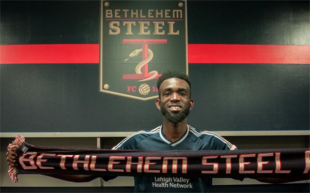 Roberts makes the ninth Steel core roster player. They have to sign three more. I expect them to sign five more to get to last season’s fourteen. The other five USL roster spots should go to reserves, younger, inexpensive players able to cover injuries and other absences in practices. By position they should be: a reserve goal keeper, a reserve center back, a reserve attacking center midfielder, a reserve center mid, and a reserve flank back. They already have signed on the roster two reserve strikers and a reserve flank mid. I am anticipating 5 Academy players starting: left flank mid, attacking center mid, defensive center mid, left flank back and right flank back. First choice practice lineup is what can be discussed in my view. The needs of the first team dominated and dictated game day rosters last season for the Steel. Looks like a solid signing. Hope to hear some news for the first team soon. The silence is killing me.